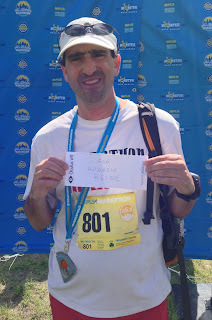 This post began shortly after I finished my last marathon, 3 weeks ago. Yet for some reason, my ability to actually complete and upload it remained incomplete. Even as I prepare today to run my next, a 50k (31 mile) race here in Canada, I am still not sure of its readiness. On June 2, I ran my first marathon in memory of someone else; I hope I do not need to make it a regular motivation. (See my pre-race blog post about my fallen co-worker Andrew Reisse.) 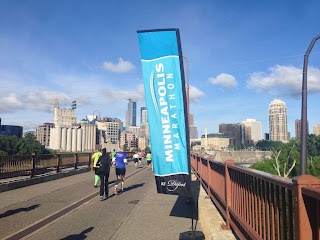 Running provides a cathartic release for me, and since plans for the trip were set before the tragedy, and my usefulness in not running would have been minimal, I chose to still travel to Minneapolis for the race. I learned of the tragedy from our co-worker, Michael, who was also Andrew's roommate at the University of Maryland 15 years ago, who phoned with the shocking, horrible, head splitting news. That call remains haunting. Yes, I have lost family members (all my grandparents, a great grandmother and a series of great uncles and aunts, my "second set" of parents from growing up), but those were all at the end of long lives or illnesses. The suddenness combine with the young age of Andrew and the potential he had to add to the world are like a riven in reality. Just a few days ago, I was cycling for a few hours, and I could clearly hear his voice in my head. I am even more heartbroken for his lovely parents and brother. I could barely call Andrew a friend; we shared working at the same company, and we had found time to talk about mutual passions. However, we had not progressed past that stage yet. For his family, as well as my co-workers who have known him since the 90's, I can barely get my head around this tragedy. So I run. And I talk. As I make a final edit, I find these words barely my own. They are not necessarily better or worse than my other posts. Just different. 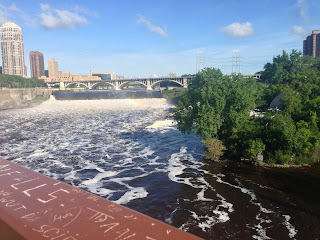 Sunday, June 2, the sun was up at 5:30, and I was walking the mile from my hotel to the bus pick up location in downtown Minneapolis. As if to illustrate my perhaps shattered brain, I would have sworn that the race started at where the bus pick up location was. I knew it finished a mile down the Mississippi River, but I truly believed it began near my hotel. Nope, and thank goodness I found out. The bus ride was short, but as I sat next to Corey from Austin, Andrew was already on my mind. After we compared notes about why we both picked this race – the same reason actually - decent marathon in a new state that was a 3 hour non-stop from home – I told him about Andrew. To be fair, no one is really ready for this sort of news. It's like a canon opens fire, and you did not even know the canon had been invented yet let alone that you sat in the sights of its dark mouth. However, something I quickly found is that people can quickly relate. Tragedy has found them or their friends or someone they know. They grapple with this news that a stranger has just shared, unbidden, and they find a connection. Maybe they share their story to help ease the burden of hearing the horror, or perhaps as a way of showing empathy to the storyteller (me in this case). I discovered this personally in another matter. My running buddy Miri with whom I have shared racecations spent this weekend at an event to support breast cancer research, celebrate the survivors and memorialize those that have lost to this disease. Miri's family has experienced the later. I was happy to make a contribution to her campaign, and felt even more glad I did when another close friend of mine was diagnosed just a few days after my donation. One does not necessarily need to have experienced the exact situation to find a touch point. At the start of the race, I met up with my friend Heather (whom I met through Miri) and her friend Dana. Heather and I ran the Fargo marathon together, and we finished in a solid time which was her PR. So, while I only met her that one time last year, we had spent nearly 4 hours running together (not to mention a few meals during that weekend). Heather is on my blog list, and so she knew of Andrew's story from my email blast. She immediately offered her sympathy and related to the suddenness of the loss, at that point just 3 days old. I shared the full tale with Dana and told both of them about Andrew's photographs (www.reisse.net if you have not seen them). Soon, the race started and we were off. After about 10 minutes of running together, I sped up and Dana and Heather good luck on their half-marathon quest (the half and full shared 13 miles together). Unlike my post-Boston Marathon London run (which I still have yet to post!) where Boston slipped in and out of my mind, Andrew never was far. I heard his voice, saw his unkept beard, thought about the mindless tragedy of his death. The day was sunny and cool, and I thought it would have made for good hiking weather. My time goal of under 4 hours was never in doubt, so I took time to snap some pictures. I particularly was happy to come across a waterfall, man-made, because Andrew photographed those so well. Mine is a pale impression on his artisan images, but I found the connection reassuring. Looking backwards, one reason for not finishing this post seems to have been processing time. After this race, my new company, Oculus VR, had to finish work on a new prototype to be shown at the video game trade show, E3. None of us really took time to breathe. I felt something akin to that between learning of that tragedy and running the London Marathon. Speaking of Boston, I saw someone ahead wearing a 2013 Boston Marathon shirt. I caught up to her and asked about her experiences there. She had finished five minutes before the blast and was well within earshot of the explosions. As you can imagine, she found it scary beyond imagine, and her relief at finishing safely ahead of that tragedy was still evident. Our paces were not matching, and with her, I did not share my story. I do not know why, as I had not impression she would take offense, but it just felt too hard to compare the two. Bringing up my past few days would have appeared as a way to find something in her experiences to match, and they were so different. Perhaps I erred in not sharing the story. I do not know. As the miles clicked off, I saw a gentlemen, Brian, wearing a 2013 LA Marathon shirt. How could I not slide up to him and saw hello? And so I did. He and his wife (who was somewhere behind us) had journeyed from LA to see their son, a recent graduate of Notre Dame, in his new home. Discovering the half-marathon, they both availed themselves of it. Brian started running marathons in 1977, and while he did not run that distance any longer, he still enjoyed 5ks, 10ks, the occasional half and relay races (which is how he participated in the LA Marathon). We probably ran together for miles at a fairly good clip. Somewhere in those two miles, I mention running in the Santa Monica mountains as I live in Pacific Palisades. "So do I," states Brian. "I live on Via," I offer. "I do too." Turns out, he abides 4 blocks away. He even came by the house the day after to say hello, but I was in Irvine for the week. Go figure. I of course related Andrew's story to him, and he promised to go look at the website posting about him. Affixed to my pack "For Andrew Reisse"
After the half-marathoners turned off the course for their last tenth of a mile finish, the course thinned out tremendously. A handful of relay runners were with the 2000 or so marathoners still on the course. Around mile 17, I saw the lead finishers coming back from the far turn at mile 19. The course support along the sunny bike path and road was sparse but vocal. 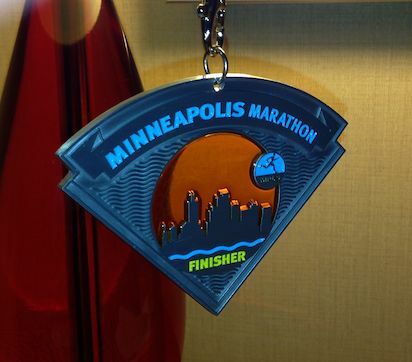 All-in-all, a super nice marathon with decent temperatures. And again, Andrew not far from my mind. One element of this weekend, as I have the benefit of looking back these three weeks, was that we had tremendously good news the day we learned of Andrew. I woke that Friday morning excited to be closing Oculus' first round of major funding. This has been a nearly three month process of flying back and forth to VCs and then preparing mounds of electronic paperwork. I was excited for us and myself. Even as we told our team of the tragedy, they were expected to hear we had closed the funding. We ultimately did not tell them for a number of days and we delayed our public announcement until this past week. 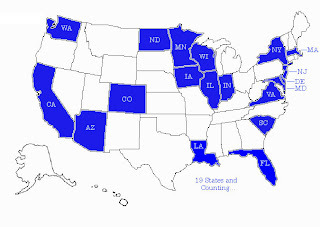 (See post at OculusVR.com) What had seemed so important for 90 days became just a footnote in a matter of minutes. I signed the final paperwork and form in a haze and took no joy seeing millions of dollars populate our bank accounts. After finishing in 3:53 time, I walked back to my hotel, showered, ate and headed to the airport. The following week was a combination of preparing for E3 and supporting the team and Andrew's family who came to town on Monday. 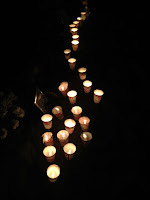 Wednesday night we had a lovely memorial service and candle lit vigil at a spot in Laguna on the water Andrew enjoyed. 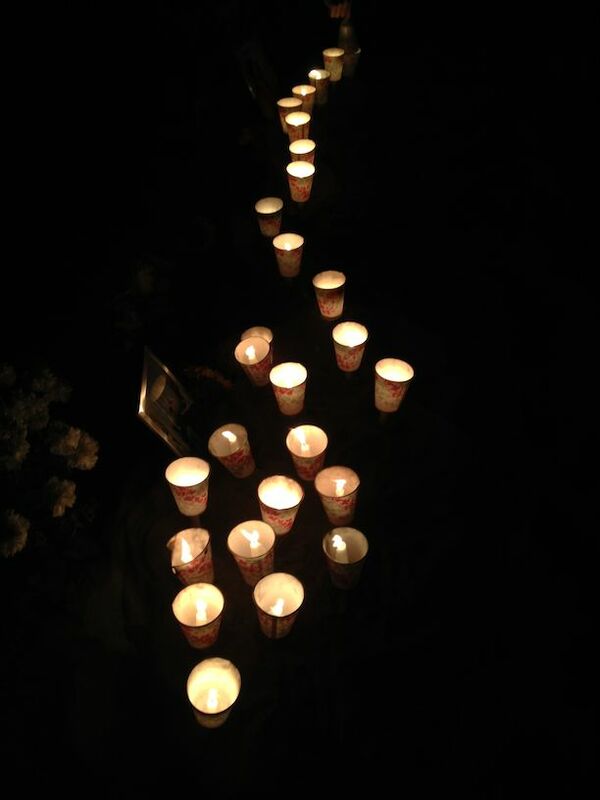 This was a different type of remembering Andrew, communal and poignant. Many of us shared stories. Relating. Processing. Celebrating. Mourning. Since that week, I spent time (with more to follow) helping set up a scholarship in Andrew's memory at the University of Maryland. Details will be announced in the next few days as I know many of you have asked where can you donate. I will be running for this charity in the fall as well. Doing that work is yet another type of mourning. By no manner is this process complete, yet each piece adds to the whole. A bit of the puzzle is filled in. I am glad I went and that I could complete my 19th state and my 42nd race. And I could share what had happened with others whom I did not know and get their support. Yet, this was no magic bullet in confronting my feelings, just a step towards the next point in the remembering someone who will be missed. Andrew was happy at Oculus and in California; he knew he was doing good work and he was important to the company. I have a sense of those feelings when I run a race well, and I like that even in his passing, their are still ways to find connections. Sunday, tomorrow as I write the italicized comments surrounding this post, will be a memorial for Andrew in Maryland. So, this weekend in many ways marks that end of this first phase of mourning, and for me, as always, is connected to a marathon. However, Andrew's work will continue on for a very long time in our code and that of others. So, while he was quiet and reserved, he had great reach and will always be a founder of our company.